The new Nicolway shopping centre has introduced a couple of new eateries to the Joburg dinner scene, Licorish Bistro (“LB”) being one. I read about LB a little while ago in some free magazine and was keen to see what it was all about. I read the menu online, as I do, and I was really grabbed by what was on offer. Team: Strangely enough, I found it somewhat tricky to assemble a crowd of people to tag along with me – some had been before, others didn’t like the sound the menu and still others weren’t available when I was. Nonetheless, I managed to twist the rubber arm of cousin and fellow restauranteerer and off we went. Décor: Whilst I didn’t see the centre in its entirety, Nicolway is somewhat of a strip mall, with the restaurants running along the outside of the centre, on either side of the walkway. We sat in the far corner of the outside area of the restaurant so I wasn’t really able to see the whole place and therefore can not really express a comprehensive view on the décor. The area we were seated in was dark, very dark. The darkness was offset by the big red leather booth style seating of the adjoining table and by our big pale blue/grey comfy chairs. Wasn’t really moved either way to be honest. Vibe: Nicolway is new – it’s going to be busy. Thursday nights are no exception. The restaurant was filled to capacity, as were the adjoining restaurants. Having been stuffed in a corner, I can’t really comment on the vibe of LB as a whole but there was a constant buzz of chatter and a few friendly dining neighbours. LB isn’t licensed (for now), so if you’re looking to settle in after dinner with a few cocktails, go elsewhere. Service: We were seated promptly by the floor manager and our waiter was in hot pursuit to give us menu’s and take our drinks order. He seemed a bit rushed though, as I had barely placed my drinks order when he was reciting the specials at great pace. Hungry as I always am, I generally like to relax for 5 minutes before being bombarded with things to think about. I requested additional lighting for our table as both the menu and table were black, making it tricky to see properly. My request was declined. That being said, our order was taken correctly and competently and there were no real complaints. Food: The menu is quite extensive and reasonably priced. Starters range from R50 to R70, mains from R70 to R150 and desserts are in the region of R50. There are vegetarian options as well as a variety of fish/seafood, meat and chicken. Starters: Its not often you see scallops on a menu in Johannesburg so when I saw them I knew what I was ordering. 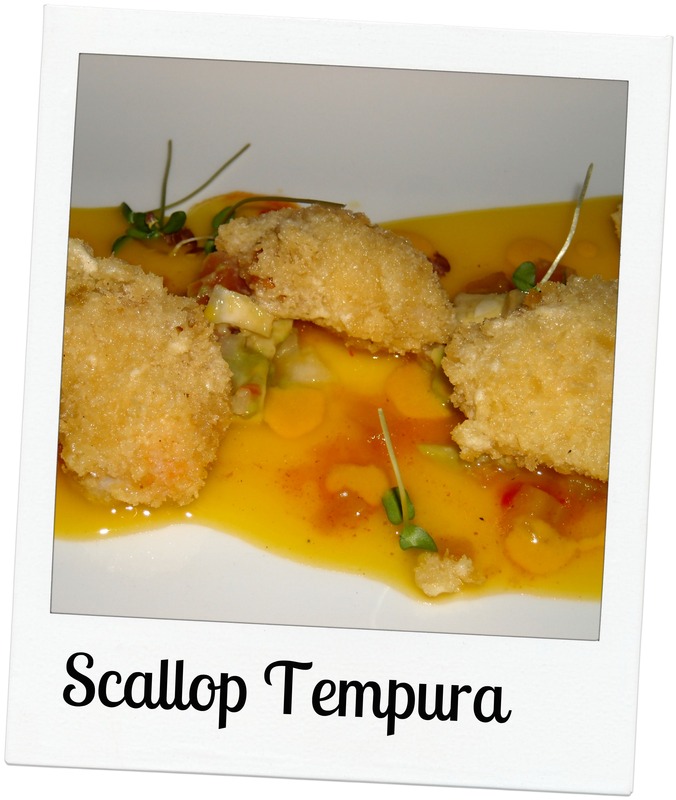 The menu reads scallop tempura with mango chutney and avocado salsa. I envisioned whole scallops coated in a light crispy batter (as is the style of tempura) served with a mild chutney and a generous helping of creamy avocado salsa. What I got was mooshy, watery scallop bits in a crumb-like batter on top an overtly sweet mango jam with a smattering of avo bits. No thanks. 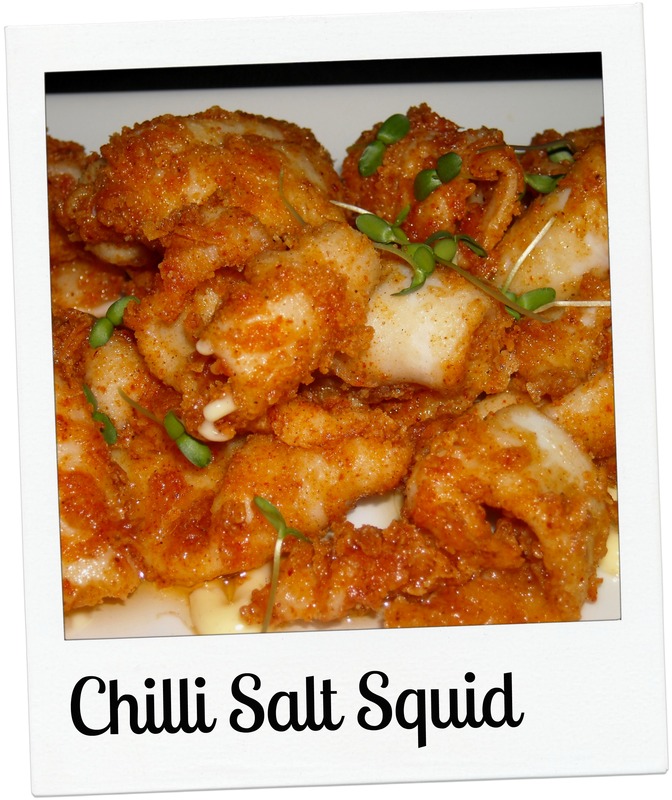 We also ordered the Chilli Salt Squid served with a cardamom mayo, tomato atchar and sesame bean sprout salad. Again, I had envisioned something different (my downfall perhaps). The squid was more calamari tubes than the heads I am used to and was crumbed and deep-fried. It was a little oily but it did ultimately taste very good. I don’t recall the sesame bean sprout salad, so it clearly was not very memorable. 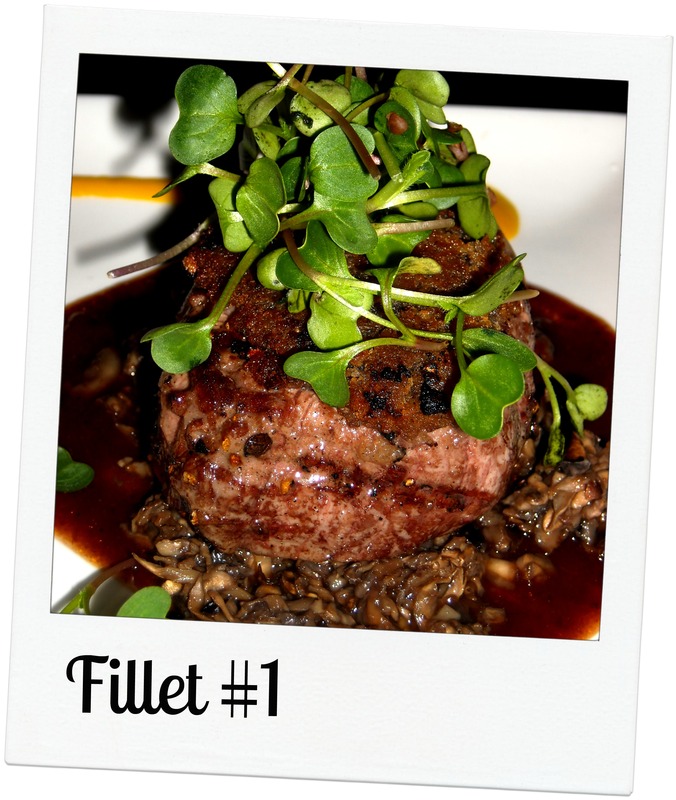 #1 Fillet steak with mushroom duxelle (a finely chopped/minced mixture of mushrooms, onion and herbs) a sauce of sorts and crunchy truffle topping. If you like truffles, which I do, then you wont be disappointed with the flavour of this dish. It packed a deep truffle flavour which was enhanced by the sauce. I thought there was slightly too much duxelle but it was delicious. 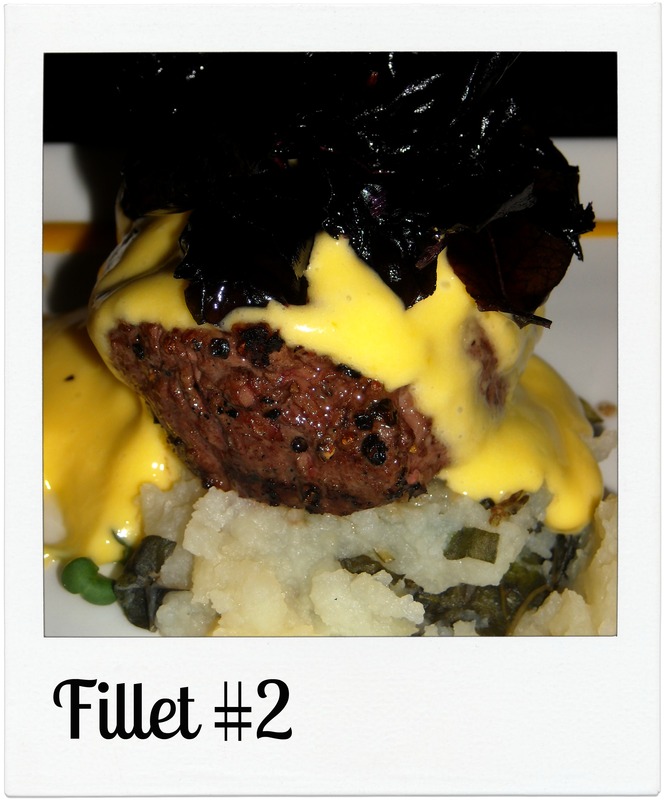 #2 Fillet steak served with mash and a béarnaise sauce. The béarnaise sauce was deliciously creamy but was decidedly tart making it more of a hollandaise, as far as I’m concerned. It was the perfect accompaniment to the rare steak. I’m not a huge fan of mash but this one was good, albeit a little cold. 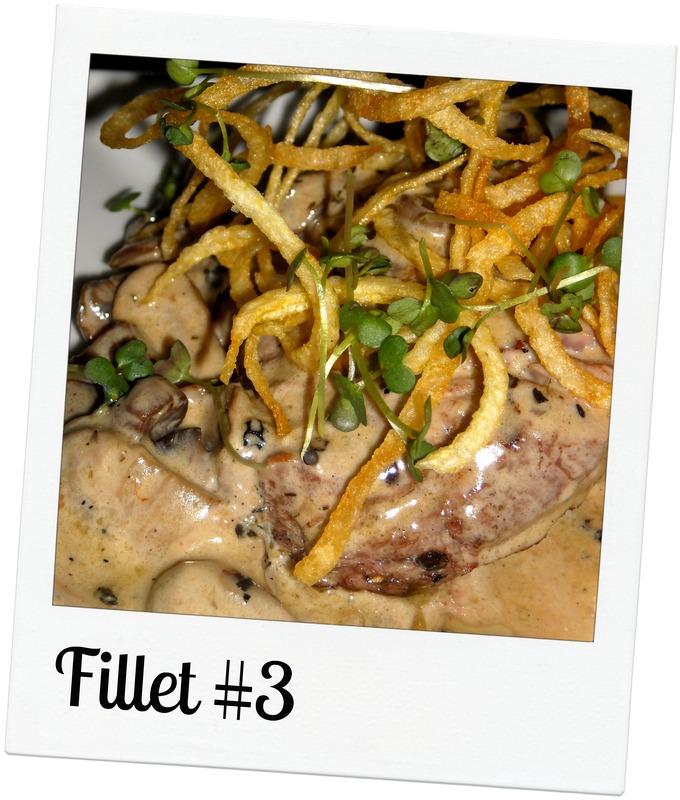 #3 Fillet steak served with a creamy mushroom sauce and crispy potato shoe string fries. You really can’t go wrong when combining fillet steak with any sort of creamy sauce, add some fries and you’re A for Away. Fellow diner ordered the crab and prawn pilaf. If you’re unfamiliar, pilaf is a rice dish typically cooked in a stock with meat or veg. 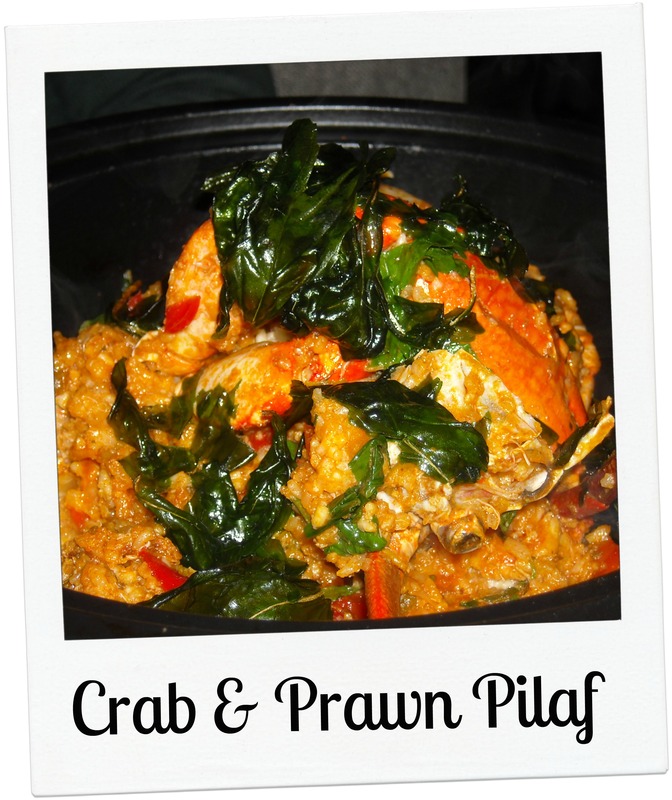 LB’s pilaf was the seafood variety made up of crabs, prawns and clams and served with a garnish of deep-fried basil. 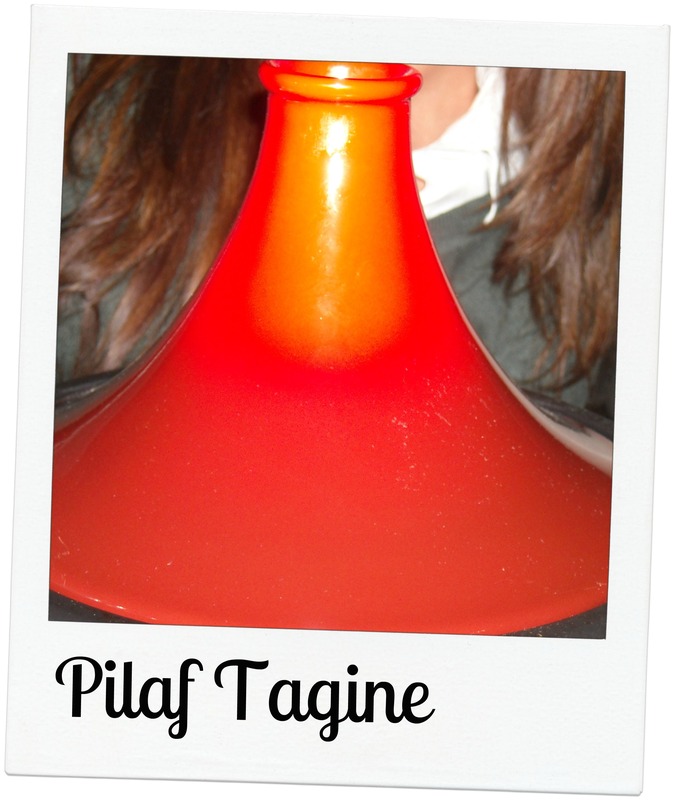 Served tagine style, this dish was huge! Well worth its R95.00 price tag. The bulk of the crab meat is out of the shell but you are given a couple of claws and a crab-crusher (not the real term) to play around with. Be warned, if you are not a saffron fan, don’t order this dish – saffron is the predominant flavour. 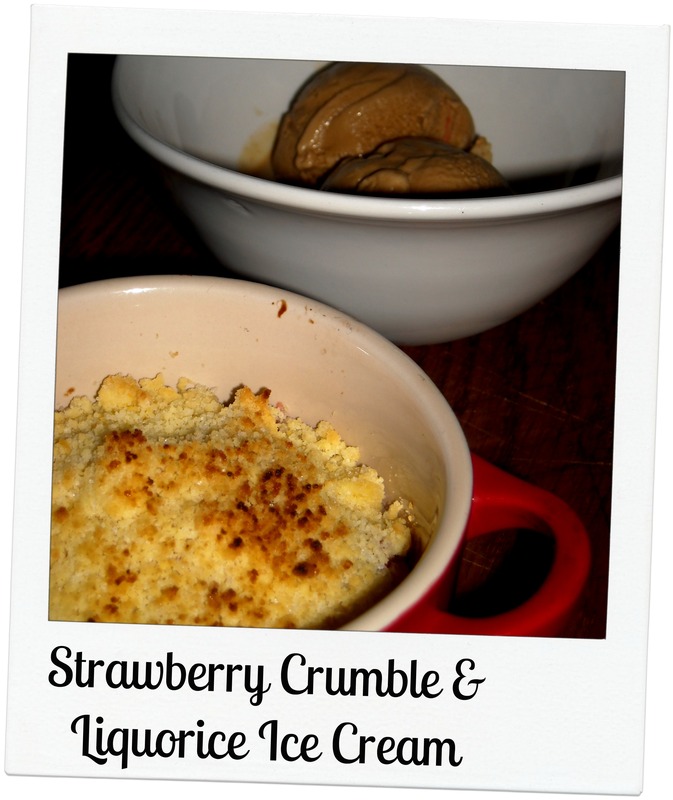 Dessert: there were quite a few interesting dishes on offer but we decided on the strawberry crumble and liquorice ice-cream. Not being a huge fan of liquorice I asked for the ice cream on the side. Thank goodness, as it packed a powerful liquorice punch. The crumble itself was very tasty and when eaten with a tiny bit of the ice cream, it reminded me of the liquorice shoe laces with the pink inside. Overall, a lovely dish. Was I blown away by Licorish Bistro? No.I personally felt there was too much focus on trying to combine as many flavours as possible and not enough focus on the core ingredients themselves. I was disappointed overall BUT the menu is large and there were definitely some other delicious sounding dishes on offer, so I will be going back soon.